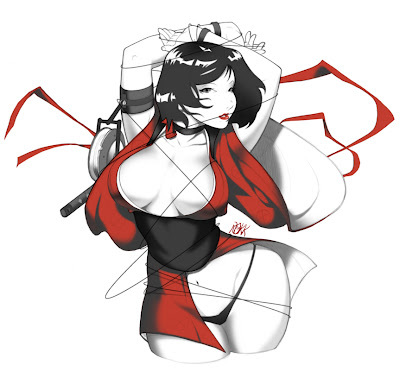 A while back I did a sketch of one of my favorite ninja of all time, Kurenai. From the ill received game "Red Ninja". When I decided to go off the deep end I, of course, kept her in mind. Also, there was a posting that I came across by some folks at Udon. They had a project where they took an old sketch and redrew it. The older sketches were like 6 years ago. I saw some pretty cool stuff come out of that project and was inspired by it. Sadly, my senses have recovered and I think its time to act more civilized. No more cleavage windows and girls with little to nothing on for a while. Although I may try to rough out a few pieces for that sketch book. We'll see.